“Liberals” generally today in the United States focus on using taxpayer money to help create better society. “Progressives” focus on using government power to make large institutions play by a set of rules while using a "progressive tax structure" to fund local, state, and federal government activities such as providing streets and highways, schools, medical services, and defense. The goal is to create equitable communities and an equitable world. Importantly, Progressives are aware of history and know that Teddy Roosevelt was cast out by the Republicans and rejected by the Democrats - he had to create his own political movement. As explained in this website, the 21st Century Neoliberal takeover of the state Republican Party organizations and the Third Way takeover of the National Democratic Party effectively shuts out the Progressive Pacific Message. It superficially seems ironic that it is not a Progressive government as envisioned by Teddy Roosevelt but 21st Century Progressive corporate leaders who propose to exercise the artificial powers of government-granted corporate franchises on behalf of the public good - in this case taking on the healthcare problem in the United States. Read the above news release carefully because the media has already misrepresented it, explained why it won't work, called it the end of health insurance or healthcare as we know it, predicted it will reduce the fed's anticipated inflation rate, and otherwise became creative about limited known facts. All three companies are international is scope. Taken together the three companies employ more than 950,000 people worldwide. Has a history of creating an internal product which then develops into a product for an external market. For current business activity holds wholesale licenses covering the distribution of medical-surgical equipment, devices, and other healthcare related equipment in at least 12 states (called wholesale pharmacy licenses which have been misrepresented in the press as for drugs). Is #3 on Forbes list of The Worlds Biggest Public Companies ranked by profit. Is #3 on Forbes list of The Worlds Biggest Public Companies ranked by profit, the largest bank in the United States, the world's sixth largest bank by total assets, and the world's second most valuable bank by market capitalization. So it isn't as if three CEO's of an auto company, a construction company, and a shipping company got together and decided to cut their insurance costs by creating a subsidiary company to buy group insurance through. Two decades ago, Jamie Dimon almost joined Jeff Bezos at Amazon before deciding to run Bank One instead. Both considered joining each other's boards, but did not because of potential conflicts. Warren Buffett has long admired Bezos and lamented not owning Amazon in its early days because he didn't understand it. The Oracle of Omaha's love of Dimon's annual letters are well-known. And all three are customers of each other. But the initiative that was announced Tuesday turned from a casual conversation into a real effort after Berkshire Hathaway's Todd Combs joined J.P. Morgan Chase's board in September 2016, sources familiar with the situation said. That meant there was an insider to pull the group together in a formal way. Talks about forming this partnership, which will be "free from profit-making incentives," really began to pick up in pace over the last two to three months, according to sources. It was during this period when the decision was made to actually form a new company and share all health-care data with this entity. An all three CEO's have been staunch supporters of Democratic candidates. In presenting this story one thing the American media seems to ignore, or perhaps they just lack historical awareness, is the peculiarity of how the provision and funding of healthcare occurs in the United States came to be and how consistent this new initiative is with that history. Today, most Americans under 65 have some version of a private health insurance program covering the cost of routine, preventive, and emergency health care procedures, and also most prescription drugs, but this was not always the case. During the 1920s, individual hospitals began offering services to individuals on a pre-paid basis, eventually leading to the development of Blue Cross organizations in the 1930s. The first employer-sponsored hospitalization plan was created by teachers in Dallas, Texas in 1929. Because the plan only covered members' expenses at a single hospital, it is a forerunner of today's health maintenance organizations (HMOs) as was the Kaiser Permanente program. In 1933, Henry J. Kaiser and several other large construction contractors had formed an insurance consortium called Industrial Indemnity to meet their workers' compensation obligations. Dr. Sidney Garfield had just finished his residency at Los Angeles County-USC Medical Center at a time when jobs were scarce; fortunately, he was able to secure a contract with Industrial Indemnity to care for 5,000 construction workers building the Colorado River Aqueduct in the Mojave Desert. Soon enough, Garfield's new hospital was in a precarious financial state (with mounting debt and the staff of three going unpaid), due in part to Garfield's desire to treat all patients regardless of ability to pay, as well as his insistence on equipping the hospital adequately so that critically injured patients could be stabilized for the long journey to full-service hospitals in Los Angeles. However, Garfield won over two Industrial Indemnity executives, Harold Hatch and Alonzo B. Ordway. It was Hatch who proposed to Garfield the specific solution that would lead to the creation of Kaiser Permanente: Industrial Indemnity would prepay 17.5% of premiums, or $1.50 per worker per month, to cover work-related injuries, while the workers would each contribute five cents per day to cover non-work-related injuries. And that was the beginning of the model of employer-employee shared cost for employee plus family healthcare and the current Kaiser-Permanente HMO model. Employer-sponsored health insurance plans dramatically expanded as a direct result of wage controls imposed by the federal government during World War II. When the War Labor Board declared that fringe benefits, such as sick leave and health insurance, did not count as wages for the purpose of wage controls, employers responded with significantly increased offers of fringe benefits, especially health care coverage, to attract workers. In the 1930s, The Roosevelt Administration explored possibilities for creating a national health insurance program, while it was designing the Social Security system. But it abandoned the project because the American Medical Association (AMA) fiercely opposed it, along with all forms of health insurance at that time. President Harry S. Truman proposed a system of public health insurance in his November 19, 1945, address. He envisioned a national system that would be open to all Americans, but would remain optional. Participants would pay monthly fees into the plan, which would cover the cost of any and all medical expenses that arose in a time of need. The government would pay for the cost of services rendered by any doctor who chose to join the program. In addition, the insurance plan would give cash to the policy holder to replace wages lost because of illness or injury. The proposal was quite popular with the public, but it was fiercely opposed by the Chamber of Commerce, the American Hospital Association, and the AMA, which denounced it as "socialism". Foreseeing a long and costly political battle, many labor unions chose to campaign for employer-sponsored coverage, which they saw as a less desirable for their members but more achievable goal as well as more favorable to the union movement, and as coverage expanded the national insurance system lost political momentum and ultimately failed to pass. The rest of the story of the mostly hodgepodge of American health insurance and healthcare providers is history which has left the U.S. with the most cost and least cost-effective healthcare in the developed world - right up through Medicare and Obamacare. (You can explore this history further at the Wikipedia articles Health insurance in the United States and Kaiser Permanente. 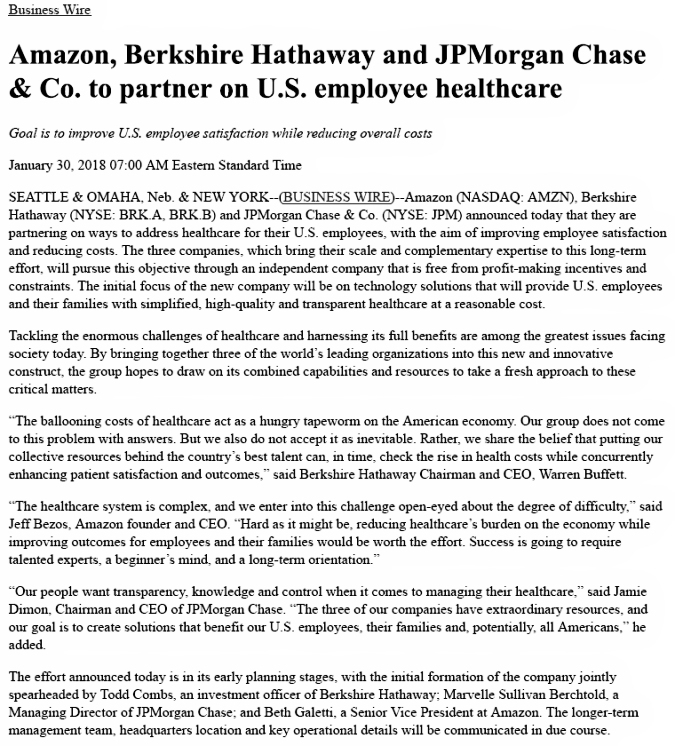 Given the chaos the federal government is in and given the Neoliberal control of two-thirds of the state governments, real Progressives will be supporting the Amazon-Berkshire Hathaway-JPMorgan Chase initiative as a possible means to further evolve American healthcare into a more cost-efficient system and a more universal coverage model. They may fail to achieve one or both goals. But anyone who thinks "the government" can do it alone doesn't understand American political history. And they most certainly have a better chance at success than Trump and/or Congress.